The original “Chai Chocolate” bar on the market and a unique experience. Milk chocolate infused with a secret blend of chai spices and bits of crystallized ginger. I'm trying to make my treats "worth it", meaning quality over quantity. I'm hoping this approach will help cut down on my treat consumption. No guarantees, of course! 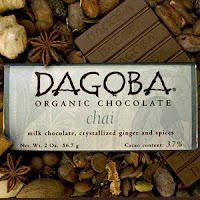 Dagoba : Delicious and organic, but...I didn’t see a fair trade seal on this chocolate bar. So Dagoba, if you are listening, please consider fair trade for all of your chocolate products. I'll remain a fan if you do. Epilogue : Apparently, Hershey's bought Dagoba around 2005. See here for comments railing against Hershey's and Dagoba's previous owner weighing in. Like I said...we're learning!